Since being MIA for a little while, I have been catching up on reading some blogs that I have subscribed to. I am really starting to take an interest in Meal planning and freezer cooking, so I thought I’d share with you my first week of meal planning. If you are at all like me, you succumb to the dreaded twelve shops a week. You only need one thing, and somehow you come out with ten items (and often, not one of those ten things are the original item you came to purchase!). This has started to become an issue as far as financially, and in food wastage and I don’t particularly feel like being on a first name basis with everyone at my local shopping centre. I do my shopping mid week (pay day woo hoo! ), so I wanted to start my weekly meal plan as of Wednesday. The print out starts from Sunday, but those meals will be for the following week, not the Sunday just gone. I created a template that allows me to plan the three basic meals of each day and break them down into ingredients needed to create each dish. 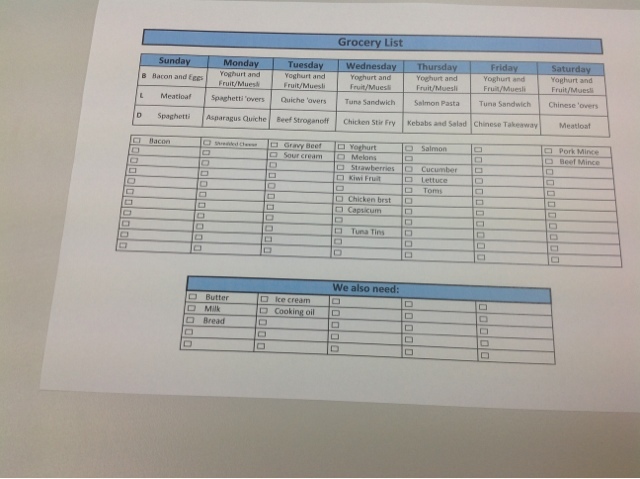 This way, my meal planner can be taken to the shops and used as a grocery list quite simply. I did a big shop last week, so most of the things I’ll be buying this week will purely be items needed for this menu. ***As a side note, the spaghetti sauce for Tuesday night has been pre-cooked and is currently sitting in my freezer. All I need to do is add pasta. I haven’t been freezer cooking for long, but I feel as though spaghetti and lasagne are my two favourite dishes to freeze because they aren’t altered all that much by the freezing process. Trial and error has taught me that some other dishes don’t freeze quite so well. Hope you guys enjoyed the method in my madness. I'd love to hear some other people's "go to" freezer meals. With Christmas quickly approaching, I'll be posting some crafty little numbers very shortly!